This will have to be another two part post, I’m afraid. There’s just so much to the human-bear relationship, never mind the vampire-bear relationship that needs to be discussed. Bears are not exactly nocturnal, but can be active during the night, so may well bump into Willow the Vampire, who needs more powerful allies like the wild boar to help her to save Earth. She’s met and become friends with a Red Panda but, let’s face it, what’s a Red Panda going to do in a battle, cuddle a villain to death or lick him into submission? At barely more than domestic cat-size, the Red Panda might be scratchy and bity in a squabble, but hardly of sufficient weight in a fight against a ten-year-old let alone a fully grown human. Fully grown brown or grizzly bears on the other hand…even in their eight-month-old cub-version…are opponents any vampire child would be proud to call her friend. Actually, bears are rather shy and avoid fighting. It’s just stupid humans who get in the way and upset the bear’s equilibrium to an extent where it’s tempted to raise a paw in self-defence or growl in a threatening way. I do very much the same thing myself with flatmates. The human relationship with bears is an ambivalent affair. As children we are given teddy bears and told they’re soft and cuddly, a human child’s best friend during sleepless nights and mummy’s absence; however, as years go by, we are told bears could wipe us out with just one swipe of their paw. If we came across them unawares in the wild, they’d be more likely to turn us into their dinner than snuggle up to us for mutual comfort. …they get clouted over the head by this very theory…at which point human males turn ugly and cry “threat to society” and “exterminate” along with “get your hands off this pelt, that’s my hearth rug your naked infant’s posing on”. Bears are blessed with a great sense of smell and can detect marmalade sandwiches from miles away, something a certain British family discovered to their cost, when they let a small South American bear into their home, after finding him stranded at Paddington Station. Around human habitats bears change their behaviour from diurnal (daylight) activity to twilight (crepuscular) and even nocturnal (night-time) foraging and playtime routines. Although they are not blessed with slim-line bodies, they are much faster runners than their awkward gait would lead us to believe, and are also excellent swimmers, particularly polar bears, which often have to cover huge distances between ice floats to get to another meal. Their lopsided gait and ponderous facial expression has often made them the target of human ridicule. However, as soon as these agile creatures climb up a tree or demonstrate how good they are at fishing that irrepressible pest, the human male, gets jealous again and wants to humiliate bears by forcing them to dance in a circus or fight with dogs in a pit for money instead of showing off how multi-skilled it really is compared to the average human male, who typically struggles to put on his own trousers and shirt without falling over. Teddy bears may belong to the family of Pooh, Steiff or Paddington, but all other bears belong to the family Ursidae. Although officially classed as carnivores, most bears are really omnivores, something many Canadian or Alaskan citizens discover when their rubbish bins are being investigated by local bears with a sweet tooth. 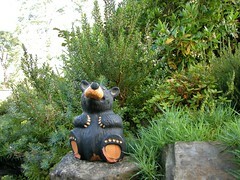 In total there are just eight surviving species of bear, occupying a widespread habitat, which ranges from countries in the Northern Hemisphere to selected parts of the Southern Hemisphere, presumably because at one point in history bears quite liked to travel (think Paddington Bear, a Peruvian visitor to the UK). From Asia to South America, from Europe to North America, bears are part of human existence, whether human males like it or not. 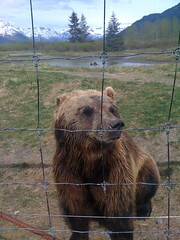 In the wild bears might eat honey – just like Pooh Bear – or nibble berries to augment their protein diet. The Giant panda on the other hand is specialised and eschews all but the finest bamboo. The Polar bear has little choice but to stick to a diet of fish and seal with the occasional penguin thrown in as a mid-morning snack, since bamboo is as rare in arctic regions as a sober human male is on a Saturday night in Cardiff. With increasing threat to their natural habitats, wild bears are coming more and more into conflict with urban dwellers. The lure of fast food and bright city lights is clearly too much for even the most determined of forest grumps. Many bears are discovering – like Paddington Bear – that marmalade sandwiches are irresistible human creations that do agree with bear taste and Ursidae etiquette, meaning they taste good when eaten with a chum, while chatting across a raided bin. 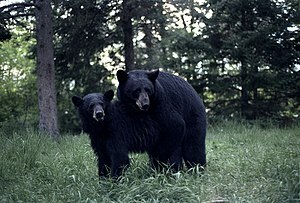 During courtship male and female bears become marginally more sociable and females turn later into the most devoted mothers, but the rest of the time bears are solitary and do not seek the friendship of others. This poses a problem for me, since Willow’s supposed to make friends with one. I’m forced to devise a heart-breaking flashback, where Willow comes across a bereaved mother bear in Stinkforthshire forest, after her cub was murdered by some worthless louts who broke into the local zoo. Naturally, the human murderers will be dealt with in classic “Willow”-style; as a result my vampy girl and Mama Bear will be friends for life. I love bears – when Will was 2 we had a Pooh bear party, I can still read Pooh bear and watch the videos. 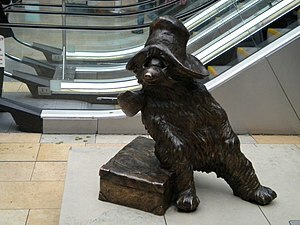 I love Paddington and often carry marmalade sandwiches under my hat. My blue teddy sits on the sofa with me when I watch tv. Great post – Pooh bear for Prime Minister! Thanks very much – I’ve just been watching “Yes Prime Minister” on Netflix, hehe, Jim Pooh Hacker…. Now I’ve got this lovely image of you and your blue bear watching Victorian mysteries together. By the way, my very first teddy bear looked just like the Steiff bear in the blog picture, only mine would have been born around 1963. Oh your teddy sounds lovely – have you still got it or were you like me always giving things away once you had grown out of them? Unfortunately, no I haven’t got it anymore, but I do have my second bear and some really old toys. I had asked my granny to get rid off a horrible huge doll which a particularly nasty great-aunt had given to me. Stupidly, my granny interpreted this as “all toys in her flat” and gave my ancient teddy away. (I must have been around 20 at the time – it was very upsetting). Oh that is awful – you must have felt terrible. I have a real thing for old toys, they give me that feeling. I also love old jewellery, it doesn’t have to be expensive just vintage and beautiful. What are your other toys apart from Ted 2? I have a mechanical clown (minus red nose, which broke off when I was little) that plays a musical instrument and a goat as well as one or two tiny teddy bears. I love the mechanical ones -( the German ones are always fantastic) they are the ones which always give me that feeling on antique shows. What’s the goat like? It’s been in storage so long, I can’t remember. Large bell around its neck, that’s about it. That’s cute, toy goats are rather unusual. I wish we hadn’t got started on vintage toys now it makes me want to go to a toy museum or looking around antique shops.